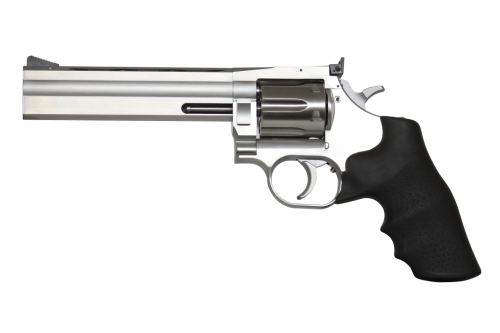 Model 460V Revolver - 5"
The 715 is as it was before – designed and built to be the most accurate, rugged and versatile revolver on the market. Shipped with a 6″ barrel, the new shroud is designated the HV6, a heavy vent shroud profile that tames the .357’s recoil very well. The original Dan Wesson revolver improved on the accuracy and service life of the traditional double action revolver design in a few ways. The tensioned barrel of the Dan Wesson interchangeable barrel system enhances accuracy, pulling the barrel tight like a guitar string, enabling it to vibrate at the same frequency every time. The forward crane latch, located in front of the cylinder and paired with a rear ball detent helps to ensure proper cylinder/barrel alignment during firing. Superior to the rear locking designs of other revolvers, it adds to the accuracy of the 715.